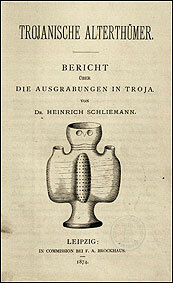 The excavation report, published on January, 31, 1874 under the title „Trojanische Alterthümer, Bericht über die Ausgrabungen in Troja von Dr. Heinrich Schliemann“ (Troy and its remains) and printed in 1000 copies only was financed by Schliemann himself and published simualtaneously in French. At the same time the accompanying plates: " Atlas trojanischer Alterthümer ". Photographische Abbildungen zu dem Berichte über die Ausgrabungen in Troja“ were published and printed in 400-500 copies only. Both publications were sold separately, the "Atlas" ran out of print already one and a half month later. The majority of the illustrations in the "Atlas" is reproduced as "photographic drawings". This means: drawings documented as photographs and reproduced as prints. Each "Atlas" volume is a unique example. The photographic plates did not survive. Most photograps and more than 100.000 copies were made by the Athenian photographer Panagos Th. Zaphyropoulos. Records indicate that Schliemann himself removed 25.000 prints because of their bad quality. However the quality of the remaining illustrations is insufficient. To illustrate the English translation of the „Bericht über die Ausgrabungen in Troja“ the photographic patterns of the "Atlas" were used to produce engravings.